Looking for a place to shop for vintage in the Nashua, New Hampshire area? So were we! A fantastic new store has opened down on Main street with an infinite amount of charm and a lot of style. 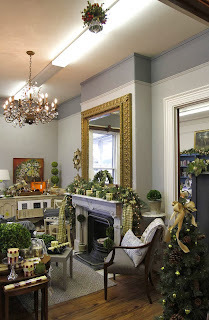 Glorious Possibilities is an multi-dealer antique and gift shop that is in an old Victorian home turned library. As you wander through the rooms, which currently look like an enchanted wonderland and holiday forest, you're lost in the magic of what could be in the next room and what you may spot in a cupboard somewhere. When I visited the shop, I knew it was the right place to open up a little Foxburrow Vintage boutique. The wanderlust and the curated sense of merchandising were an ideal match for my sensibilities. So, I got in touch with the fantastic owners (it's a family run business) and we agreed on a space for Foxburrow Vintage. The little Foxburrow boutique will feature a curated rotation of garments every 2 weeks, as well as lots of fabulous home goods that won't ever make it to the Etsy shop. I'm very excited about this new venture and all of the wonderful possibilities that open up with a place for my customers to shop, and new customers to find me. You won't hear much of an update until after Christmas, but keep checking back to find out how the progress is coming along! Foxburrow will be moving in the second week in January and I'll post photos of the boutique so you can see how it's looking.